Process 1/3 of the kernels in a food processor. Combine whole kernels with the processed corn. Add mayonnaise, yogurt, chili powder, salt, lemon and cotija cheese. Mix well. You can add a chopped jalapeño for a spicier dip. Corn on the cob is one of the most popular street foods in Mexico. If you walk around town, you'll see vendors with food carts and large pots used to cook the corn in a mixture of water, salt, epazote and other spices. The aroma inundates the streets and becomes irresistible. People usually eat the corn right off the cob or they cut the kernels. 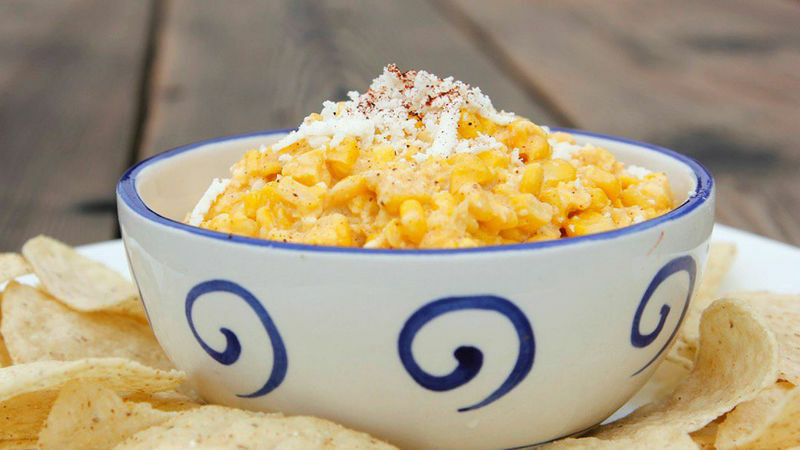 The corn is served warm with various toppings like mayonnaise, crema, cheese, chili powder and lemon. I have wonderful memories of my trips to Mexico and that's exactly what inspired me to make this corn dip. It makes me feel like I’m enjoying corn on the cob right at home.